Galaxy S8+: How do I use Direct share on my Samsung Galaxy S8+ (SM-G955W)? 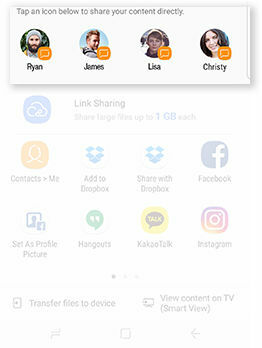 Direct Share lets you share content with specific contacts directly using the sharing panel from any app. 4. 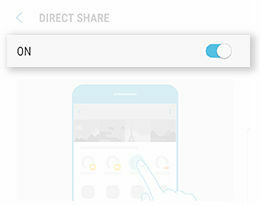 Swipe to and touch Direct share. Note: This function should be enabled by default. 1. Navigate to the file you want to share. From the Home screen, swipe up or down to access the Apps screen. Then, touch Gallery. 2. 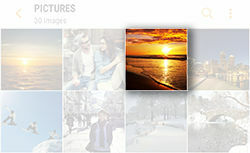 Touch and hold the image you want to share. 4. Select the contact you want to share the content selected with.